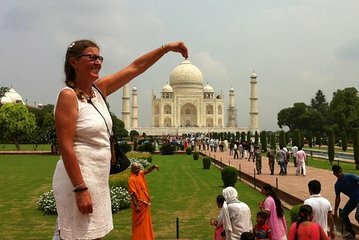 Se hai base a Hyderabad ma vuoi fare un breve viaggio ad Agra per vedere il Taj Mahal senza il fastidio di organizzare tutto da solo, questo è il tour ideale. I voli di ritorno, il trasporto via terra e l'hotel sono inclusi per un'esperienza conveniente. Il tour è stato progettato in modo da poter vedere l'alba al Taj Mahal, ma se si viaggia di giovedì questo sarà invece un tour al tramonto (poiché il Taj è chiuso il venerdì). Great private tour. All transfers went smoothly, our driver was very reliable and our tour guide was very knowledgeable. And the Taj Mahal and Agra Fort were amazing!! We booked this on a whim, an hour before heading to India.I had some thoughts that it was fake but happy to say I was wrong. It was awesome. Guides and drivers were timely and reliable. The drivers had less English proficiency but did get us from point A to point B in sometimes treacherous Delhi/Agra traffic.The site guide was thorough in giving us the relevant history and tolerated my probing questions. And he was very adept at taking great photos of our group. Lunch was pizza and Pepsi on the road. We skipped the hotel dinner as we were still full but did enjoy a drink on the rooftop deck of the hotel, with a view of the Taj. Also enjoyed the excursion to buy inlaid marble work from local artisans sponsored by the India govt. We all loved the trip!